Today we’re delighted to be interviewing entrepreneur David Lester, founder of Impressions Software, Crimson Publishing and former director of Watford Football Club. David trained as an accountant with Arthur Young before founding computer games developer and publisher Impressions Software in 1988 when just 22. Impressions developed games such as Kenny Dalglish Football Manager (more on this later), Caesar I, II and III and Lords of the Realm to mention but a few. These titles generated sales well into the millions. In 1999, after selling Impressions, David formed magazine and website publishing business Crimson Publishing. Crimson have gone on to become a major player in the start-ups industry with Startups.co.uk, a website dedicated to helping new businesses that receives over 200,000 visitors each month. Accountancy and computer games are two industries you wouldn’t necessarily link. Explain the move from Arthur Young to Impressions. I’ve always been a big fan of business. I love business, I find it interesting. It was the Thatcherite years when business was booming. It was the first time people were starting to talk about various business people as celebrities, people to look up to and I caught that bug I suppose. The best training at the time for someone looking to go into business was to become an accountant. I certainly didn’t want to practice as an accountant; I never imagined I’d do that but I did think it would be useful to get a qualification. I started out down that road and got very bored within less than a year, I really thought it was dreadful. I had various computer games contacts so I decided I wanted to start a computer games publishing company as a hobby with some friends. So that’s what we did, and it went very well. How important was the job at Arthur Young to your success? It’s important for anybody contemplating business to know about the world of work. There’s a lot of talk at the moment about how we can get more people who leave university to go and start their own business but I think the vast majority of people who leave university should go and work for someone else first. It’s dangerous to start a business straightaway without that knowledge. There are circumstances when it works well but it’s unusual. Even though I didn’t like the accountancy job very much I learnt a huge amount from it and that definitely helped me build my own business later. I think that if you are going to start a business you really need to know an awful lot about it to make it work. If I was going to open up a restaurant tomorrow I’d want to work at somebody else’s restaurant first. Unless you know how the industry works from the inside you just don’t know enough to be successful. I think it’s too risky and I’m sure that’s a big part of why so many businesses fail. We knew that football games were really popular so we thought “let’s make our first game a football game”. We thought it would be great to get a football star’s name attached to it and the biggest name in football at the time was Kenny Dalglish who managed Liverpool. So I rang him up. It was amazing, I remember ringing up Liverpool Football Club from a payphone during my coffee break and they put me through and he was there. I don’t think it would happen today. Amazingly he said “yes”, put me in touch with his agent and we did a deal. We agreed to pay him a percentage of the revenue generated from the game. We arranged a photographer, got the pictures taken and used his image on the game. It was number one all summer in 1989. It did very, very well and gave us a lot of cash to build the business from. How did you follow up Kenny Dalglish Football Manager? We produced a mixture of games but we rapidly saw that our interest and strength lay in strategy games. We decided to specialise in them and got better and better at it. Our biggest games were Caesar and Lords of the Realm. Caesar II and Caesar III both sold about 2.5 million copies around the world, very much a hit. Lords of the Realm II also sold another 2.5 million copies. Did you have any surprises or hurdles while running Impressions? A number of them. We had this great success early on with Kenny Dalglish Football Manager and then we had a number of games that didn’t do as well as we expected. We ended up having major cash flow problems, so for about two years it was extremely stressful. I would be up until the early hours of the morning going through the numbers working out who we could afford to pay and when. We couldn’t always afford to pay everyone on time. It was very hard work indeed, very stressful, a real hurdle. We tried to raise some money to make life easier but there was no established business angel community back then and there was certainly nothing like crowd funding. We were too consumer focused for the technology companies and too technical for the consumer venture capitalists, so we fell between the stools. At the time the computer games industry was only a few years old, most people thought it wouldn’t last very long and so it was very hard to raise money. In the end we decided we needed to launch in America. I bought a one way ticket out to Boston and set up an office there with two people to start with and over the next three years we built that up to fifty people. Frequently you hear about companies from Britain going to America and doing very badly but in fact America made us. In 1995 David sold Impressions Software to Sierra On-Line for a “life-changing sum”. 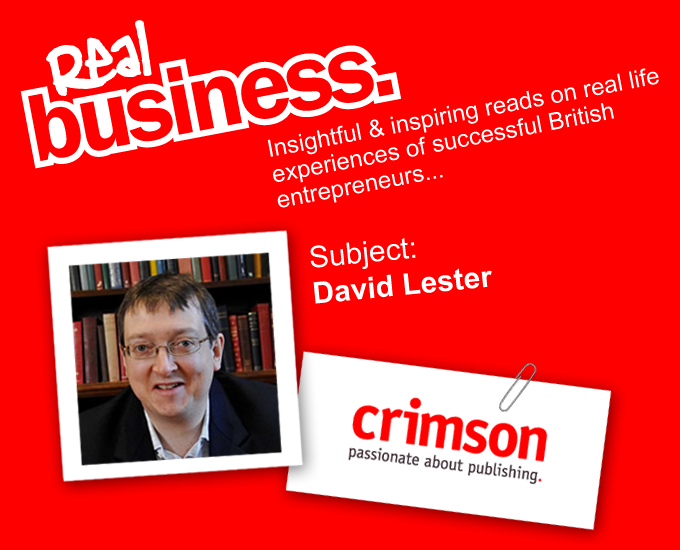 His next venture was Crimson Publishing which David launched in February 1999. From computer games to a publishing company, again, it isn’t the most obvious move. No, it’s a strange move and I think it was a very large move. I started a magazine and web publishing business less than a year after leaving a computer games business. We launched a number of websites and magazines; we did some things very well and we did some things very poorly. Our first magazine at Crimson was called What Laptop which launched in August 1999 and is still going strong. I thought we would sell more copies than we did but I also thought we would get less ad revenue than we did so we ended up being more successful than expected. I think the biggest thing that I didn’t understand was advertising sales. As I mentioned earlier, I strongly recommend that somebody who starts a restaurant goes and works in that industry first and I didn’t do that. On the Crimson site you mention an “absolutely disastrous acquisition of a wedding magazine”. Can you tell us more? That was the single biggest mistake we made. We went out and tried to buy a magazine. I was interested in the idea of doing women’s niche magazines, pregnancy, childcare, mothering, weddings and so on. We thought buying this wedding magazine [Wedding Day] would be a good start as it was breaking even and the company that ran it had just gone bust. However, once the company went bust all our competitors got straight on the phone to the advertisers and said “the company’s just gone bust, why don’t you move your advertising to us?”, so a lot of the advertising that we thought had been booked in turned out to have been cancelled. That cost quite a bit immediately. There were also a lot of personality clashes. We had a pretty clear plan for what we wanted to do with the magazine, but the existing team said “that would be such a big mistake” and we ended up letting them make some decisions and essentially those decisions were terrible. The truth is I didn’t put enough effort into it and I didn’t manage it well. I’ve spoken to a lot of entrepreneurs who’ve done the same. When a lot of people sell a business they feel very successful. You think you walk on water. I felt I was better than I really was and I rapidly proved that I wasn’t, so we lost a lot of money. Wedding Day alone cost me two or three million pounds. Crimson is a publishing business and the world of publishing is evolving very fast, it’s quite an exciting industry to be in but also quite a scary industry to be in. The reason I set up Crimson was to do Startups.co.uk. I had visions of giving great quality information to people to help set up and run a business. Indeed, we have done that, we are the UK’s leading small business website by quite a long way. Our traffic is bigger than ever and our market share is bigger than ever on the web, but we probably have less revenue today than we had five years ago. It’s bizarre and what we’re doing at the moment is transitioning away from being purely dependent on advertising income to being much more of a partnership based business model. There’s an explosion in the number of services that are being delivered digitally by entrepreneurs to businesses. We’re trying to see which of these might serve our readers better. There’s an old adage for business; “profit is sanity, turnover is vanity” so turnover is not a factor I chase at all these days. I don’t think about turnover ever but I think very much about profit. We’ve come across it at our awards as well, lots of small interesting, exciting, fast growing digital companies that don’t have a very big turnover but are very profitable and really that’s what we’re turning Crimson into. The best advice I can give is to get close and stay close to your customers. It’s very easy to be close when you first start and very hard to stay close once you’ve started. There’s a whole knack to this, you can’t just believe what customers tell you because sometimes they’re wrong. They won’t be lying to you but they won’t necessarily know what they want until someone like Apple comes along and shows them a different way of doing things. So that’s my single piece of advice for any business. Tell us a little bit about being your own boss. I would never do it any other way. If it’s for you, you’ll love it and never look back. I don’t think it’s for everybody. There are books called Anyone Can Do It [two books with the same title] about starting a business and I don’t think anyone can do it. You don’t have to have degrees or wealthy relatives but you’ve got to be able to withstand risk. People who are more nervous or anxious probably shouldn’t do it. There are higher highs and lower lows when you run a business, I’ve certainly experienced both. You’ve got to be willing to give your all in a way that very few people do for a job. It’s very much a total commitment if you want to make the business work. Finally, having run your own businesses, what have you learnt about yourself? That I love making decisions in business. How to price a product, what to call a product, how to package a product, I very much enjoy that. When you try something and it works it’s a great feeling. To sell millions of copies of a game or tens of thousands of copies of a book or get tens of thousands of readers is fantastic. This entry was posted in Real Business Case Studies on February 6, 2013 by Mathew Aitken.